Image: ibrewcoffee/Instagram/Original photo was cropped but not altered for this article. Plain coffee is great, lattes are better, and lattes with art on top? Well, those just set you up for a good day. 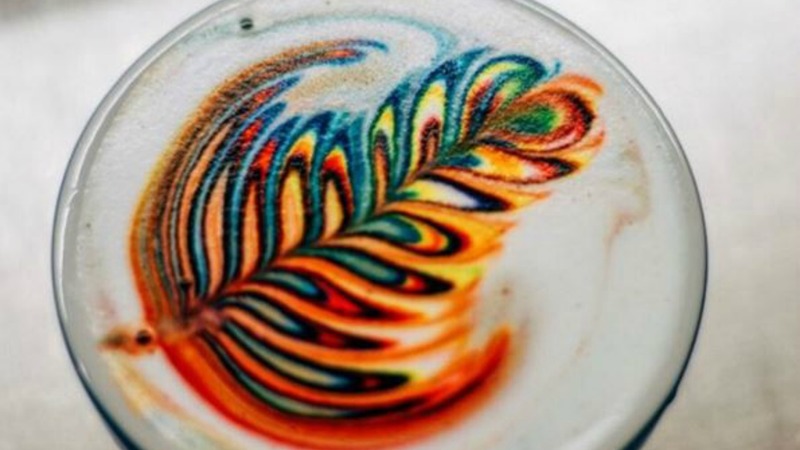 But Mason Salisbury of Sambalatte in Las Vegas has done one better, pioneering a technique called free-pour latte art that uses food dye to make rainbow lattes. Food dye is added to the steamed milk, and when it’s poured into the latte, magical, multicolored rainbow swirls are created. Basically it’s a way for baristas to practice making cool latte art — they can track where the different colors go so they have a better idea of how the milk moves when it’s poured. But more important, it creates rainbow lattes! Like, why isn’t this a thing coffee shops do on purpose to serve up some extra fun with our coffee order? Caffeine is great, but I can’t think of anything that would put a smile on my face in the morning more than treating myself to a fun rainbow latte. And now that rainbow bagels and rainbow grilled cheese are a thing, what else are you going to drink with your meal? Monotone beverages just don’t cut it anymore. Would you drink a rainbow latte? Or are you a coffee purist who shudders at the thought?